Here'll you find recent news updates on Ken, including match reports. Mark Williams survived an amazing Ken Doherty fightback to win 18-16 and take his second world title in one of the tournament's best-ever finals. It was a victory which seemed simple after Sunday night's play, when the Welshman's brilliant snooker had given him an 11-5 lead. Even that emphatic scoreline represented something of a comeback for Doherty, who had been 10-2 down at one point. But the Irishman has proved remarkably resilient and he was full of fight on Monday. The number five seed produced a spellbinding session on Monday afternoon, winning six frames in a row to pull back to 11-11. Williams looked bewildered at that point, but finally bagged a frame as he edged a tight 23rd to regain his lead. But Doherty was in no mood to let go. Every time Williams moved ahead, he fought back, moving the score on to 14-14. The Welsh world number one finally clicked into form, and when he moved 16-14 ahead, it looked as though Doherty's challenge could be over. But again the Irishman rallied, taking the score to 16-16. All Doherty's previous opponents had wilted in the face of the pressure, but Williams responded in emphatic fashion. He took the final two frames, the last with a 77 break, to clinch his second world crown and complete the treble of the UK Championships, B&H Masters and Embassy World Championships in a single season. 60-37, 82-55, 0-97 (76), 73-29, 86-30 (62), 82-12 (52), 74-30, 75-56 (75 and 56), 24-85, 118-4 (118), 76-1, 101-0 (101), 0-79 (79), 69-70, 75-0, 51-60 (50 Doherty), 10-73 (52), 31-62, 6-128 (128), 17-61, 49-82, 39-70, 68-41, 0-115 (115), 62-19, 23-98 (92), 87-0 (87), 45-78, 121-0 (120), 77-0 (64), 17-68, 9-120 (112), 96-28, 120-0. 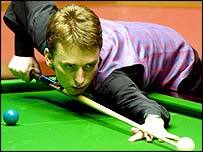 Ken Doherty produced one of the greatest comebacks in Crucible history to beat Paul Hunter 17-16 and reach the final of the World Championship. Trailing 15-9 at the start of play on Saturday, Doherty knew Hunter only needed two frames to win the match. But the Irishman showed amazing nerve to take the first five frames. "It was the most incredible game I have ever played in," said Doherty. "I always believe that I have a chance. I always say to myself, if you dream about it, it will come true. It's one of the best feelings. "I thought if I keep taking frames it is going to get harder and harder for him. If you keep crawling back, then sometimes the tie can be won." Doherty revealed he used the fear from his near-collapse against John Higgins to inspire him to his amazing win. The Irishman saw his 10-0 lead evaporate to 10-7 against the Scot in the quarter-finals before he rallied to win 13-8. 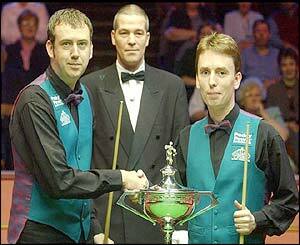 "Against Paul, I put myself in the position of John Higgins when he was playing me," said Doherty. "I was feeling the pressure in that match. I put Paul in my shoes and just kept chipping away at his lead." Hunter remained philosophical despite missing out on a first-ever appearance in a Crucible final. "I just didn't get any rub of the green at all. I am devastated but hopefully it will make me stronger," he said. "Ken stuck in there all the way. I knew he would but it's only a game and I'll come back fighting, well hopefully. "This has been a great learning curve for me. It just wasn't to be my championship this year." Both players made a host of errors in the tensest of situations, but after Hunter moved 16-14 ahead, Doherty dug deep to produce a sensational finish. 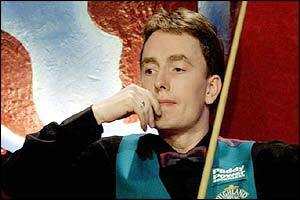 Ken Doherty booked his place in the last four after beating John Higgins 13-8 in an incredible quarter-final. Higgins, who had pulled the score back to 10-6 after being 10-0 down, then won the first frame of the final session to increase the pressure on Doherty. But the 1997 champion dug in and he won the 18th frame on the black after a superb 63 clearance before making the score 12-7 in the next. Higgins pulled one frame back with an 82 break but Doherty claimed the 13-8 win in the first frame after the interval. Doherty expressed his relief after surviving the brave fightback from Higgins. "When I was 10-0 ahead I had to pinch myself. Some of the frames were the best I have played here," he said. "But the match turned completely when John started coming back. The pressure was really on and things started going against me. "I dug a great clearance out to go 11-7. It could have been 10-8. It gave me the confidence to go on. I'm relieved to be through." But Higgins did not take any consolation from his fightback. "I just stuck in there. I am just disappointed to be out at the quarter-final stage for the second year running," he said. "Ken's break at 10-7 was big. If I had made the score 10-8 then you never know but losing it took the wind out of my sails and I never recovered. "I was 10-0 down I was just trying to win a frame. I was not even looking at the scoreboard."